Workers in two McDonald’s restaurants will make history on September 4 when they become the company’s first ever workers in Britain to go on strike. They will join a growing band of McDonald’s employees around the world that have unionised to fight one of the biggest and best known global fast food operators. The issues at the two restaurants – one in Cambridge, the other in Crayford, southeast London – relate to cuts in hours so that workers there cannot make a living wage and regarding allegations of bullying. This led 96% of union members, numbering around 40, to vote for strike action. Behind these lie wider demands: a £10 per hour minimum wage, an end to zero hour contracts and the right to have a union recognised by McDonald’s for negotiating on members’ terms and conditions of employment. McDonald’s must consider reinvesting its huge amount of net profits back into its workforce. We believe it is our right to ask for a fair treatment for the hard work we perform. The strike is a major milestone in the work of the Bakers, Food and Allied Workers’ Union (BFAWU) and the Fast Food Rights campaign set up by the union with the help of the Unite the Resistance group and Labour MP, John McDonnell. 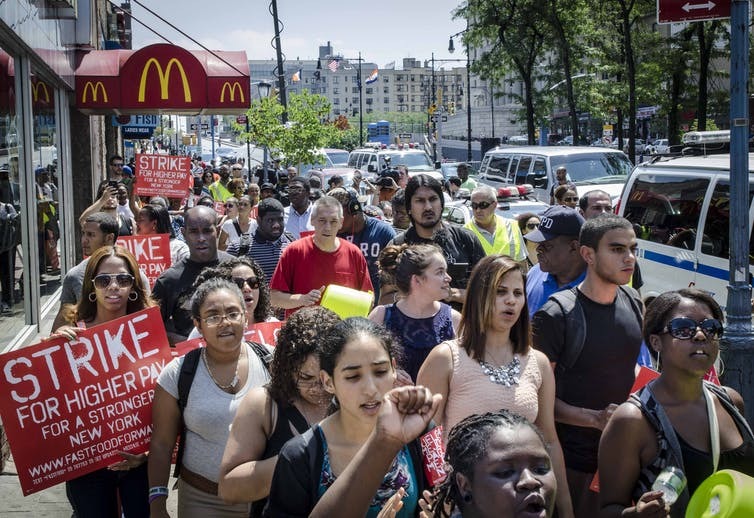 The campaign was established in early 2014 to try to replicate the fight of fast food workers in the United States. Fast food workers there have, along with the help of unions and community groups, collectively organised to raise their pay and conditions. Since 2012, this has evolved into a series of increasingly large nationwide strikes. From 2013, their central demand has been encapsulated in the slogan “Fight for $15” – a minimum wage of US$15 per hour and enough hours to earn a living on. Success has come through direct action against the fast food operators as well as political lobbying to gain local wage ordinances. For some time, McDonald’s in Britain has been under pressure to end its use of zero hour contracts. Earlier in 2017, it promised to phase them out by offering fixed hours. The beef of the workers is that this has been too little, too late, as the offer has been rolled out through limited pilot projects. The September 4 strike is part of a wider national day of action against low pay that day across Britain, which the Fast Food Rights campaign has called for. It is also in coordination with the US Labor Day holiday to signify solidarity with fast food colleagues there. Yet underneath this act of global worker solidarity is something much more fundamental. Until now, the Fast Food Rights campaign has been mainly about protests outside fast food outlets, often mainly by supportive non-fast food workers. The strike signifies that a small number of fast food workers are now prepared to try to close down operations themselves from the inside. This new found spirit will be critical in determining whether the strike grows into a bigger challenge to McDonald’s and gains support from the tens of thousands of workers it employs in Britain. The battle between the BFAWU and McDonald’s is akin to David and Goliath. Around the world, McDonald’s has long been known for its staunch and well-resourced defence to remain “union free”. With around 20,000 members, the BFAWU will need to call on all its reserves and know-how in order to take the struggle forward successfully. This will mean unionising many more McDonald’s restaurants than the six at present, mobilising them into collective action and getting supporters outside their own ranks to engage in disruptive flash mob protests to shut down restaurants from the outside. But there will also need to be campaigns to damage McDonald’s reputation and brand through social media as well as the more conventional leafleting outside its restaurants. These are the kinds of tactics that have proved successful in the US in moving toward a US$15 minimum wage across the US. The struggle will need to have both industry and political dimensions in order to develop the necessary leverage over the company. Crucial to all this will be a good strike result in Crayford and Cambridge because it will galvanise and propel things forward. If that can be done, the 180-year old BFAWU union will have helped transform itself into a modern day giant slayer.